WEST BOYLSTON, MA U.S.A. (December 12, 2016) – Emuge Corp. has introduced “circle-segment” cutters, an innovative class of end mills designed to enable substantially more material removal with fewer passes in 5-Axis machining, over 80% cycle time reductions and up to 50% smoother surface finishes. Circle-segment tools are a totally new end mill design, exclusive to Emuge. 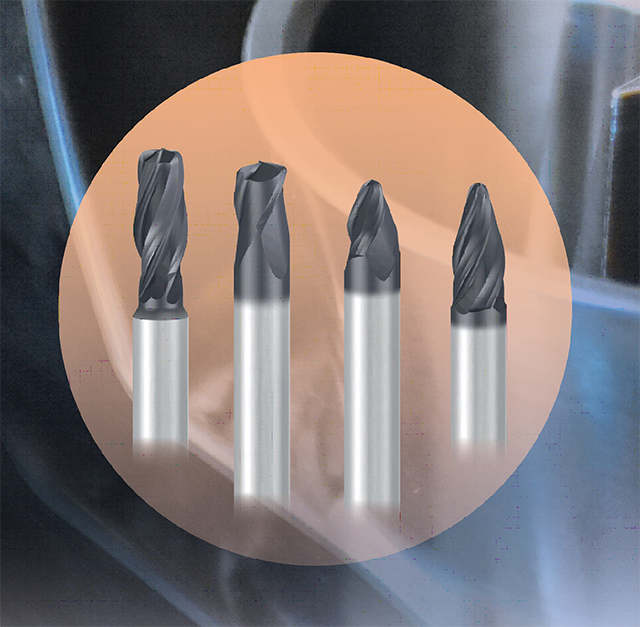 These high-performance tools, ideal for machining turbine blades, impellers, blisks and in mold making applications, feature unique forms with large radii in the cutting area of the mills, allowing a larger axial depth of cut during pre-finishing and finishing operations. Emuge circle-segment solid-carbide end mills are offered in four geometries: barrel-shaped, oval form, taper form and lens shape. Oval and taper form mills are ideal for curved shapes such as blades or straight-walled pockets, freely engaging more of the cutting edge. Barrel design mills provide highly effective flank milling to the sides of spiral grooves and similar applications, while lens shape mills excel in narrow channels or in lands on molds. Specific CAM system software, such as hyperMILL® (OPEN MIND) or Mastercam® Version 2017 is required to support and compute the geometries of Emuge circle-segment end mills to achieve the performance levels the tools were designed for. “Our all-new circle-segment end mills, only available from Emuge, provide unprecedented levels of machining performance in complex 5-axis applications, allowing precision manufacturers to attain dramatic time and cost savings, while increasing part quality,” said Mr. Bob Hellinger, President of Emuge Corp.
Emuge circle-segment end mills are offered standard, and are in stock at Emuge Corp. North American headquarters. Emuge Corp. is a wholly owned subsidiary of the 1,500+ employee German company EMUGE-Werk Richard Glimpel GmbH & Co. KG (Lauf, Germany) that has been the product technology and performance leader in their field for nearly 100 years. The company manufactures an extensive line of taps, thread mills, drills, end mills, toolholders, clamping devices and other rotary cutting tools, over 100,000 items sold through distributors worldwide. Emuge also offers end-user technical support through a network of in-the-field engineers and in-house product specialists, all with extensive tooling and application experience. Over 10,000 types of cutting tools and accessories are stocked in the company’s U.S. and Canadian Headquarters located in West Boylston, MA, U.S.A. The 21,000 square foot state-of-the-art facility includes a new technology center with a machining and tooling demonstration showroom and classroom, tool reconditioning manufacturing, warehouse, sales, support and administrative offices. For more information on Emuge products, contact Emuge at 1800 Century Drive, West Boylston, MA 01583-2121, Tel. 800-323-3013, internet: www.emuge.com. Mastercam® is a registered trademark of CNC Software, Inc.